Chevy Nova Spirals Out Of Control On The Strip! FAIL! In this video we are taken to WYCO Racing’s ‘Operation Octane’ No Prep Event on the Pit Road at Kansas Speedway. There are several powerful vehicles ready to rev up and let their power unleash on the strip.In this clip we watch as two Nova’s battle it out for bragging rights and drag strip glory. Unfortunately the orange Nova gets a bit to excited and ends up losing traction causing it to swerve all over the strip. Talk about a bummer! To witness the drag strip fail in action click the video! 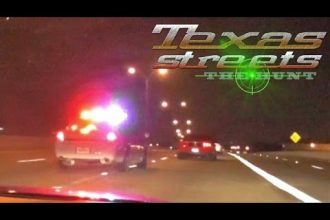 Police Lights Flipped On- No Problem With This Police Officer!